The Available All Wheel Drive (AWD) system delivers confident handling on most surfaces. The system uses a unique Intelligent Driveline Dynamics control strategy software developed by Jaguar that features sophisticated algorithms to react intelligently to road conditions. Predictive, as well as reactive, the system helps prevent you from losing traction instead of working to regain it. Press the Start button and XE awakes, the needles sweep, the engine growls. The JaguarDrive™ Control rises to greet your hand. Pulsing with a heartbeat, XE creates an emotional connection between you and your car. This technology, developed for the F-TYPE, allows the XE driver to fine-tune the engine, steering, gearshift and suspension characteristics to best suit his driving style. The heart of the XE is its engine. In true Jaguar style, each one balances refinement, fuel economy and performance. The XE offers a range of gas and diesel engines to suit every driving style. There is the turbocharged diesel engine, the dynamically proven 2.0 liter 4-cylinder gas engine and the same spine-tingling supercharged V6 powerhouse featured in the F-TYPE. With the XE, power comes in many forms. Flowing from front bumper to tail, the rising waistline of the XE gives it a sense of dynamism, even when stationary. Other signature design cues like the side power vents and front grille pattern deliberately echo the F-TYPE sports car. Further enhancing the purposeful looks are the Jaguar embossed chrome side vents and crease lines, also inspired by F-TYPE. One glance at the taut rear haunches, and perfectly proportioned overhang – and you know that it could only be a Jaguar. The XE is part of a new generation of Jaguar cars built using our state-of the-art Jaguar Lightweight Aluminum Architecture. XE offers three sound systems designed to please the most demanding audiophiles: a Jaguar system, powered by an 80W amplifier, and two others that have been created by British audio experts Meridian™. The first has a stunning 380W amplifier, the second offers an impressive 825 watt surround sound System, delivering state-of-the-art sound quality through 17 speakers. Both use advanced signal processing to deliver pin-sharp audio-reproduction. With a tap of the finger, the XE can transport you to a concert hall, a dance club or a stadium. Blending the finest materials with exquisite comfort and technology. The Jaguar XE is a theatre for the senses. When you combine over 60 years of sports car design experience with luxury materials and a host of interior options, you create a connection that’s uniquely personal. A unique stepped dashboard sweeps gracefully away from driver and passenger, giving XE a sense of elegance and space. The XE is a surprisingly compact 183.9 inches long by 77.4 inches wide (excluding mirrors), yet it can carry five adults in complete comfort. And with 15.9 cubic feet of trunk space it can accommodate everyone’s luggage too. The available Autonomous Emergency Braking system gives you an audible and visual warning if the XE forward camera senses a potential collision. If you don’t take evasive action, the car is designed to brake automatically to reduce the impact. 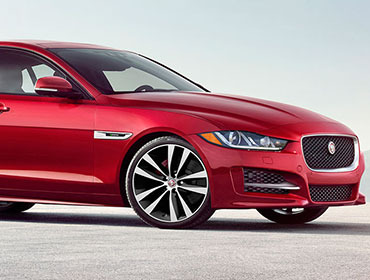 The Jaguar XE features an advanced double wishbone front suspension design based on the F-TYPE sports car. This helps give the XE a similar level of agility and “connected” steering feel. 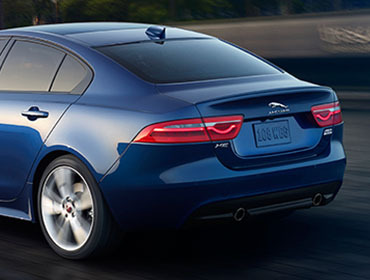 At the rear, an integral link rear suspension made from hollow forged aluminum helps provide excellent lateral and longitudinal stiffness, delivering sharp response and handling while retaining the refined and luxurious ride befitting a Jaguar sport sedan. The XE offers an optional laser Head-Up Display (HUD) - projecting essential information and navigation directions directly into your line-of-sight on the windshield. Just another way we help keep your senses connected to the road.